In large waste water treatment plants, the flocculator and the clarifier are combined together to achieve economy in construction. The combined unit of flocculator and clarifier is known as clariflocculator in waste water treatment process. Clariflocculator shall have two concentric tanks with inner tank serving as flocculation basin and outer tank serving as clarifier. Plate and Tube Settlers have been developed as an alternative to shallow basins and are used in conjunction with both existing and specially designed sedimentation basins. Plate and Tube Settlers are shallow settling devices consisting of stacked offset trays or bundles of small plastic tubes of various geometries. They are used to enhance the settling characteristics of sedimentation basins. The shape, hydraulic radii, angle of inclination, and length of the plate and tube settlers will vary according to the particular installation. Normal practice is to insert the plate or tube settlers in sedimentation basins (either rectangular or circular) of sufficient depth. The flow within the basin passes upward through the plate or tube modules and exits from the basin above the modules. The solids that settle out within the plates or tubes move by means of gravity counter currently downward and out of the tube modules to the basin bottom. To be self-cleaning, plate or tube settlers are usually set at an angle between 45° and 60° above the horizontal. When the angle of inclination of plate or tube is more than 60° the efficiency of the settling basin decreases. If the plates and tubes are inclined at angles less than 45°, settler will tend to accumulate solids, which must be flushed out periodically (usually with high pressure hose). The need for flushing poses a problem with the use of plate and tube settlers where the characteristics of the solids to be removed vary from day to day. Tube settlers are a light weight structure composed of closely spaced tubes on an incline (usually between 45° and 60°). Clarifier up flow is passed through these tubes. Settling within these tubes and contact clarification of fine floc results in a build-up of particles on the tube surfaces. Particles combine to form agglomerates which become heavy enough to slough against the upward flow and slide down the tube slope to join the sludge blanket below. Tubes are supplied in module form – each being 1 meter wide by 1 meter long by 0.67 meters high. The modules are arranged on a supporting framework to form a layer within the clarifier. The tube settlers are suspended at a height 700mm below the top water level. The above figure shows the supporting framework, module installation and settler positioning at Inlet clarifier in waste water treatment. The framework is held up by a number of ‘hooks’ over the top rim of the clarifier tank. This was done to minimize the installation time. The entire installation may be completed in three days in an existing Water Treatment Plant, the clear water storage was filled to capacity prior to installation of the tube settlers to allow for the three days the plant was off line. High rate tube settlers are designed to improve the characteristics of the rectangular basin and to increase flow through the tank. The tube settlers consist of a series of tubes that are installed at a 600 angle to the surface of the tank. The flow is directed up through the settlers. Particles have a tendency to flow at an angle different than the water and to contact the tube at some point before reaching the top of the tube. After particles have been removed from the flow and collected on the tubes, they tend to slide down the tube and back into the sludge zone. Tube settlers and lamella plates are very useful in plants where site area is limited, in packaged plants, or to increase the capacity of the existing shallow basins. Hence the load on the filter will be less. Algae growth in tubes and plates may cause maintenance and odor problems. Easy to clean in Lamella but not in Tubular Module. Careful attention is necessary for ,the design of inlet and outlet structures to avoid turbulence and uneven flow. Sometimes high pressure hose water is injected to flush out the solids. Most up flow designs are called” sludge blanket” clarifiers. After coagulation and or flocculation in the sludge blanket units, the incoming water passes through the suspended layer of previously formed floc. 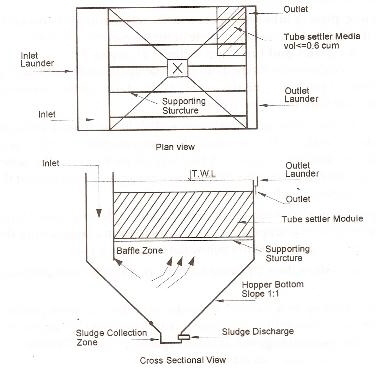 The below Figure shows an up flow sludge blanket clarifier. Because the center-well in these units is often shaped like an inverted cone, the rise rate of the water decreases as it rises through the steadily enlarging cross section. When the rise rate, decreases enough to equal the settling rate of the suspended floc exactly, a distinct sludge/ liquid interface forms. Sludge blanket efficiency depends on the filtering action as the freshly coagulated or flocculated water passes through the suspended floc. Higher sludge levels increase the filtration efficiency. In practice, the top sludge interface is carried at the highest safe level to prevent upsets that might result in large amounts of floc carryover into the overflow. Excessive sludge withdrawal or blow down should also be avoided. The sludge blanket level is often highly sensitive to changes in throughput, coagulant addition, and changes in raw water chemistry and temperature. The original Pulsator Clarifier was developed in the early 1950′ s. Now it is a properitory item designed and installed by M/ s Degremont private Ltd. Raw water distribution channel and perforated distribution pipes. Lamellar Plates and/ or Tubes for clarification. Clarified water collection laterals and channel. Coagulant water is stored in the upper part of the vacuum chamber for a given period by creating vacuum. The hydraulic force is then released, and the coagulated water is pulsed at a high velocity through distribution pipes into the Pulsator. Sludge blanket in the pulsator flocculates and remove the particles. 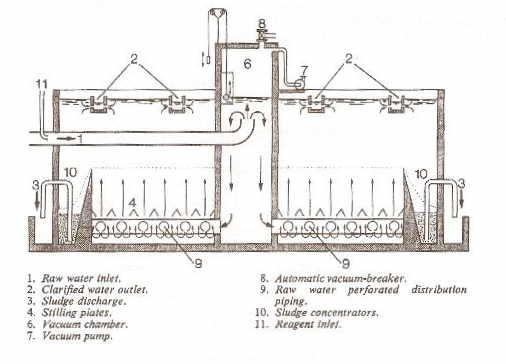 A set of channels (launders) is provided at the top of the Pulsator to collect the clarified water evenly. By removing the air by suction from the vacuum chamber vacuum is created. As a result, the water level rises gradually inside the vacuum chamber. When it reaches a set level between 0.35 m and 0.45 m above the Pulsator water level, a contact suddenly opens an air inlet valve. Atmospheric pressure is immediately applied to the water stored in the vacuum chamber, which pushes the water into the perforated distribution pipes at high speed. When the water level inside the vacuum chamber reaches the low level approximately 10 – 20 cm above that in the Pulsator, the air inlet valve is closed and the cycle begins once again with creation of vacuum. The sludge blanket in the bottom part of the Pulsator is subjected to alternating vertical motions. It expands when the water rushes from vacuum chamber during drop, for a short time (5 -20 sec.) and then shrinks (packs) during vacuum creation which lasts 25 – 50 seconds. Thus once in about 60 sec the water is pushed into pulsator through sludge blanket and the sludge blanket expands and shrinks once during that time. Frequency of pulsing is adjusted according to turbidity in raw water; For high turbidity shorter pulse interval (30 to 40 sec) and for low turbidity longer pulse interval 45 to 60 sec) is provided. The sludge blanket gradually increases in volume due to entrapping the impurities contained in the feed water. When the level of the sludge blanket rises above a specified level (weir level), and sludge spills into the concentrators. 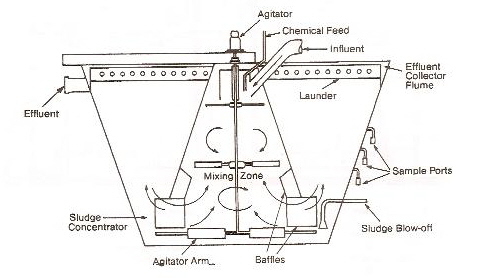 Sludge concentrator contains number of hopper bottomed tanks; The sludge is extracted from the concentrators at regular intervals. I’m Nguyen Manh Hao, currently working for the company- Vietnam Petro Mecahnical & Electrical.,Jsc (PVME). One of the us specialize in implementing projects of technical infrastructure such as water supply, drainage and wastewater treatment. Our clients are tower block/building, the agencies implementing the ODA projects, businesses and holiday zones of high-level …. Vietnamese market is very potential system because wastewater treatment is very lacking. Now that the Vietnamese government is very interested in this development environment, especially environmental waste water. •	Consulting and providing equipment systems waste water treatment project for tower block/building, the rest of high-level zones. •	Consulting and providing equipment systems industrial wastewater. •	Consultant and provide equipment for projects using ODA. I think that with the strength of technology your company along with the convenient availability of us, we will have high quality products exclusive rights in Vietnam. If your company are interested in this, I hope the cooperation between PVME and your company successful. we are not providing or supplying any water treatment equipment we are the free educational and consulting team. but i need a full design criteria of the pulsator clarifier .. so i ask if you can give me design parameters like ( Time needed inside vacuum chamber , time needed in clarification zone with be out side vacuum chamber , Depth of water inside vacuum chamber , Depth of water outside vacuum chamber , and if there is any ratio between the diameter of vacuum chamber and clarification zone ) . Wow, superb blog content! How long have you been blogging for? you made blogging content very easy. The overall your site is wonderful. I am working on L&T and currently i am working in waste water treatment plant i.e. 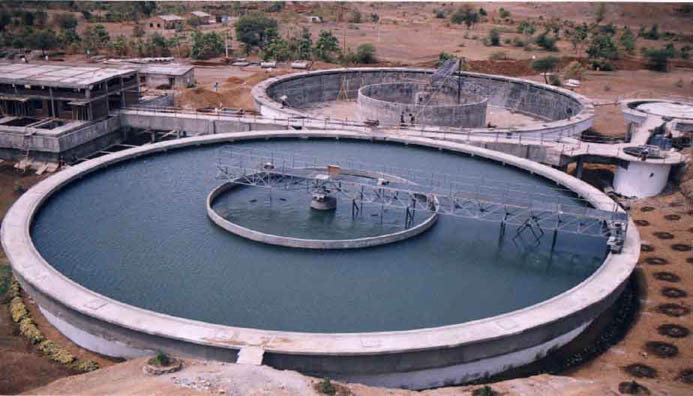 effluent treatment plant for power generation unit in India. I like your way to explain the think. it really help me so thank u.
currently we have Retangular Tank (LxBxH-11’x7’x10.5′), now we need to convert this noramal flat tanke to textile effluent clarifier, so kindly provide a design with proper dimension with exact slope calculation to hold sludge in the bottom where we will keep outlet to take the sludge from bottom to filter press (@ the center of the Tank). great stuff, fully detailed easy to read and understand thank you. hello sir .Iam pHD student Imade poilot of pulsator my poilot worked .but Ineed some new information either essay for probe . can you help me.